Sgt. Maj. Terry Preston stands in front of a formation of 1st Infantry Division Soldiers during a transfer of authority ceremony held in Poznan, Poland, Feb. 28, 2018. 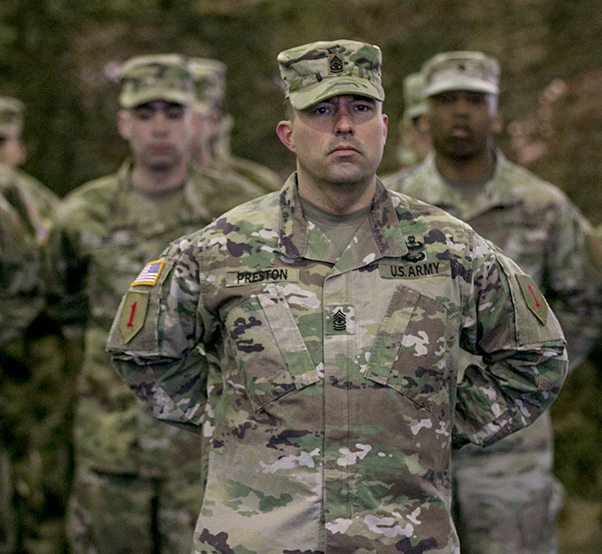 The U.S. Army Training and Doctrine Command is refining the Noncommissioned Officer Professional Development System to prepare personnel for the multi-domain battlefield, and provide Soldiers with the maximum amount of college credit for their professional military education. 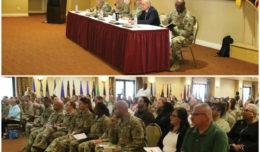 After receiving extensive feedback from Army personnel at all levels, TRADOC learned that Soldiers felt professional military education was irrelevant to them, redundant, lacked synchronization between courses, and played little to no role in preparing them for the multi-domain battlefield, said Command Sgt. Maj. David O. Turnbull of the Combined Arms Center. Turnbull spoke Tuesday at the Association of the U.S Army Institute of Land Warfare Global Force Symposium and Exposition in Huntsville, Alabama. Moving forward, Turnbull said, TRADOC will make changes across all levels of Army professional education — from the Basic Leader Course to the Sergeant Major Academy. Each course, he said, will build upon on six core competencies. Those core competencies are communications, leadership, program management, operations, training management, and readiness. TRADOC is also refining their training and education curriculum to meet college accreditation standards, said retired Command Sgt. Maj. John Sparks, who serves now as special assistant to Sgt. Maj. of the Army Daniel A. Dailey. One change TRADOC will make to reach the goal of elevating standards within Army PME, Turnbull said, is to require written responses during testing rather than multiple choice. Additionally, Structured Self-Development courses will see some changes by June 1st, Turnbull said. 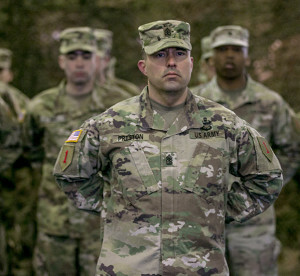 U.S. Army Training and Doctrine Command is refining the Non-Commissioned Officer Professional Development System to prepare personnel for the multi-domain battlefield, and provide Soldiers with the maximum amount of college credit for their professional military education. On the panel: retired First Sgt. Stephen Canonico, assistant director for Soldiers and Army Civilian Affairs on the left, retired Command Sgt. Maj. special assistant to the sergeant major of the Army, retired Command Sgt. Maj Dan Elder, Command Sgt. Maj. David O. Turnbull, U.S. Army Combined Arms Center, and retired Sgt. Maj. of the Army Kenneth Preston. Each course will be about 40 hours in length and will support the course material offered at a physical facility. Most importantly, SSD is no longer considered a “pass or fail” course. It will generate a grade point average, which will be included on a Soldier’s Service School Academic Evaluation Report, or Form 1059. 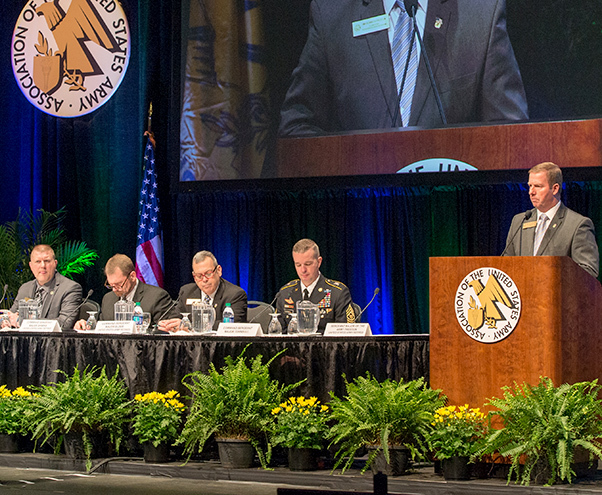 The Army is also exploring improved credentialing opportunities for all Soldiers. To support this initiative, the Army prioritized credentials into three separate categories. The first category includes required credentials for a Soldier’s military occupational specialty. 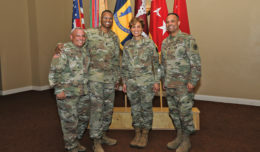 The Army will continue to fund credentials in this category, as they are embedded in a career field’s program of instruction and are considered to be necessary for promotion. The second category will include MOS-enhancing credentials. These credentials must be proponent-recommended and seek to increase Soldier readiness, retention, and professionalism, Turnbull said. The last category — self-development credentials — aims to provide Soldiers with more training opportunities before they leave the force. Currently, there are over 11,000 self-development credential opportunities available to Soldiers. 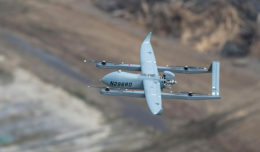 However, the Army is working to reduce that number to a more manageable size, Turnbull said.